I was super excited to attend not one, but two Clinique events this weekend. As you may have noted, Clinique is my go-to brand, particularly for skin care, but I also have a few make-up pieces through the (SO super-awesome) gift with purchase. · If you find a brand you like, sign up to emails and visit their counter often. Many brands will run special promotions and if you’re on their database you get special treatment at the counter, they make note of your products, and (my fave) you are more likely to get free stuff. · And because I love free stuff so much… only buy your essentials when they have gift with purchase. The Clinique goody bags are so awesome, not just a lame lipstick from last season. You usually get about eight different products, and a cool toilet bag, and it’s a great way to try new products in sample size that you couldn’t usually afford. Those sample sizes are also fantastic to travel with. So Clinique are promoting their new Chubby Sticks for eyes, and Farmers were running workshops on how to use them and Life Pharmacy called me up to do a personal consultation. Great! The workshops are really good fun but you’ve got to get into them. Ask lots of questions and volunteer to be the model – I did this on Saturday afternoon, and the lady not only did my eyes with the new product (well, one eye, I had to do the other one myself) but she also wanted to show a ‘finished product’ so she matched me for foundation, blusher and lip colour as well. So basically I had my make-up for that evening done by a professional for free. Go me. The Chubby Sticks for eyes are like a creme eyeshadow in a stick. So you can kind of just whip them over your eyes and create cool looks. There are a range of colours and they’re all pretty and shiny. So far so good. They blend together nicely so you can create some cool looks. And the salespeople SWEAR they stay on all day and don’t crease. As usual, the Farmers counter ladies had theirs painted on and perhaps if you have access to testers all day they do ‘stay on’. But I had one of the boldest looks applied and by the time I got home it was barely there. My partner even said “Usually those ladies really slap it on ya” as I took my selfies of the end result. This was no more than half an hour after application, and you can see that only the green side is still there. Before I left the shop there were blues and purples in there as well, but these were nowhere to be seen. 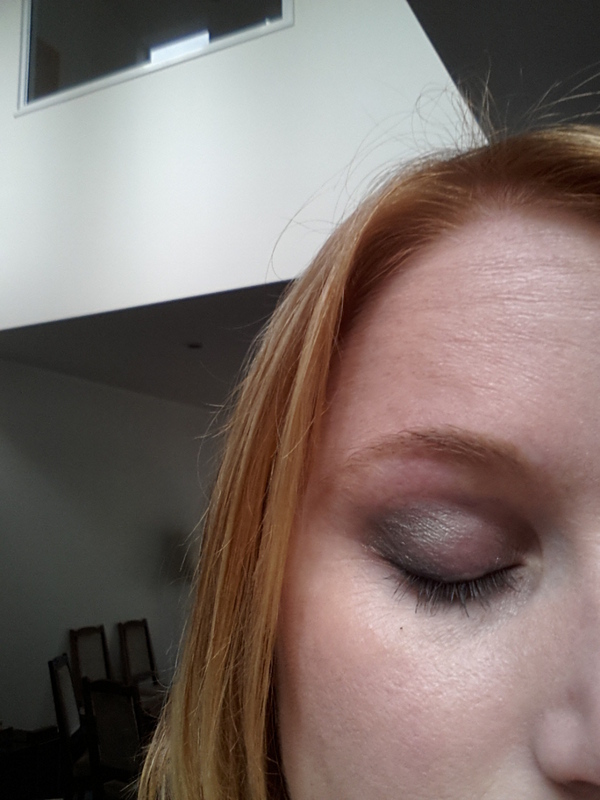 My experience of crème eyeshadows have so far been fairly unsuccessful. I had one from Covergirl, another stick-type deely with a shade at each end. That one creases and fades. It’s pretty much rubbish, even if I put powder over the top. So then I started using crème shadow only as a base. 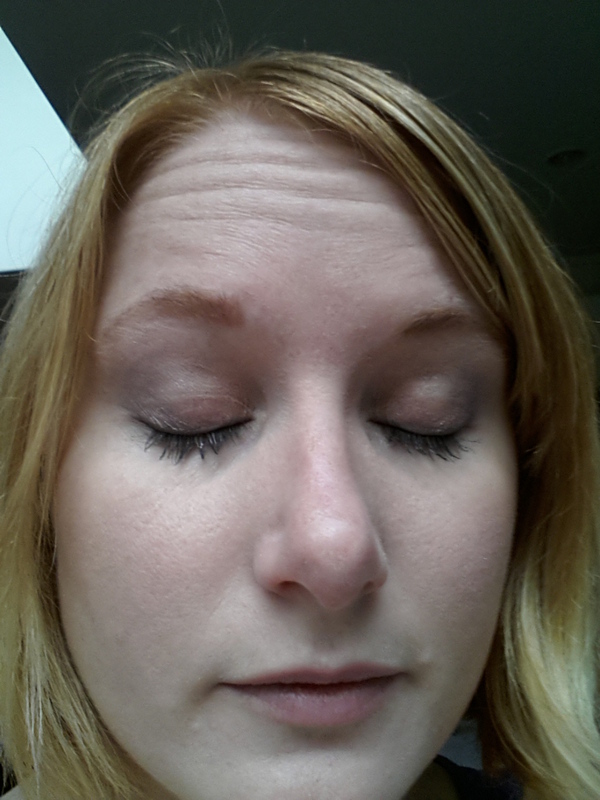 I bought a palette from Revlon with light to dark mauves and it works fantastically as a base. My powder eyeshadow now pops and sparkles like never before – and it stays on all day. Again, this stuff is rubbish on its own – it fades and creases – but I wouldn’t bother putting powder shadow on without it now. Seriously, it makes all the difference. So anyway, I went into my appointment at the pharmacy on Sunday for further investigation (and the hope of another free gift – thankfully it wasn’t a Chubby Stick, but their amazing long-lasting eyeliner in a super funky indigo colour – WIN!) The girl there was really great and ran through my skincare again to make sure I was using the right products (fantastic customer service) and did my make-up again. This time we tried a more subtle look, and I was pretty convinced about the end product this time, although still dubious about the longevity of it. It looked great in the lights of the pharmacy. She was absolutely positive that it stay on all day. Well, half an hour later at home you can see from this picture that this is not the case. It’s barely there. Even for a ‘subtle look’ – as they say their products all try to achieve – this is not holding up to a simple stroll home. So, lessons learned? If you do go to events or consultations like this, don’t buy the product in-store. They use these things to whip you into a frenzy of oestrogen-fuelled consumerism while you’re in the shop. Take your free gift and make-over and tell them you’d like to see how it holds up at home. Also, if the girls have done it for you, make sure the result is something you are able to achieve on your own – don’t be afraid to ask for samples to ‘see how it goes’. And finally, even if you have a great brand, sometimes they can’t do everything. I’m still 100% spending my money with Clinique when it comes to most things, but ‘fad’ products will come and go, and not necessarily hit the mark.